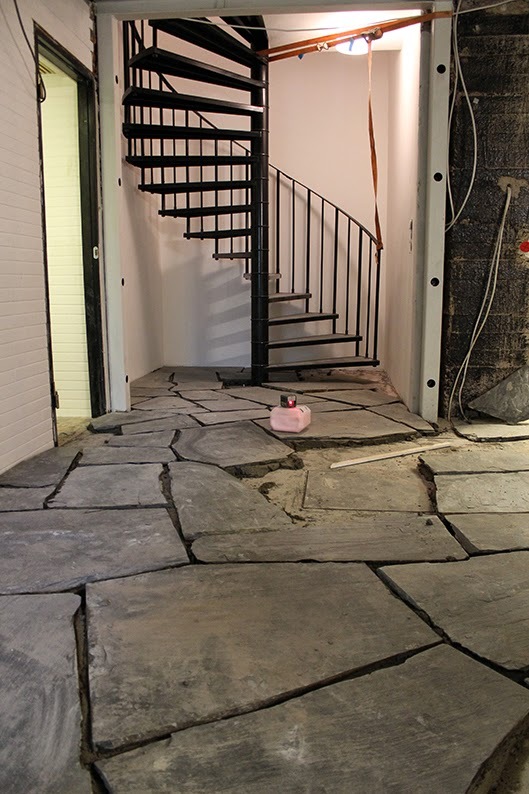 Almost a year after the slate floor stones appeared on our backyard the time has finally come to install them downstairs. Unbelievable, finally an obscure pile will be transformed to a beautiful floor! The process began by Pekka once again carrying things. He laid out some of the available pieces (instead of keeping them in a pile on the backyard), thus making the selection process much smoother. This way it is easier to choose the pieces which best fit next to each other. 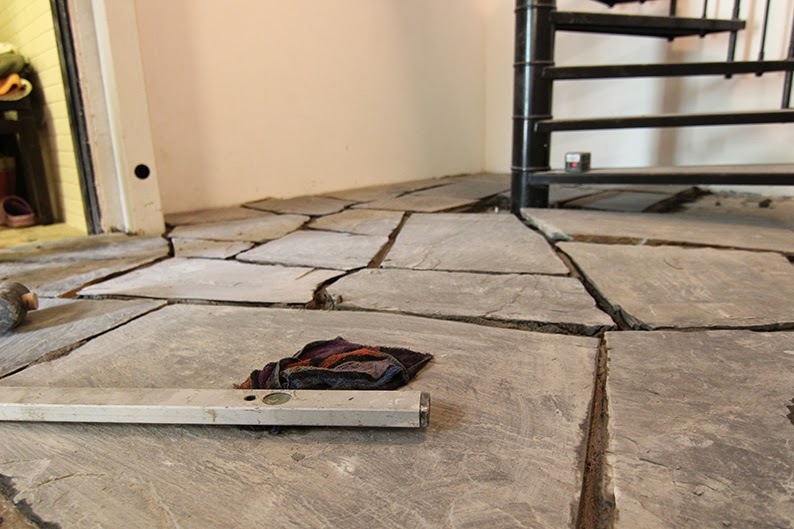 If you have no previous experience in installing a slate floor, it might be a good idea to call a pro to do the job for you. It is does not seem to be the most difficult thing in the world, but there is one fundamental challenge: if you screw up the only way to backtrack is with a hammer drill. So no, it is not Pekka in the picture below! 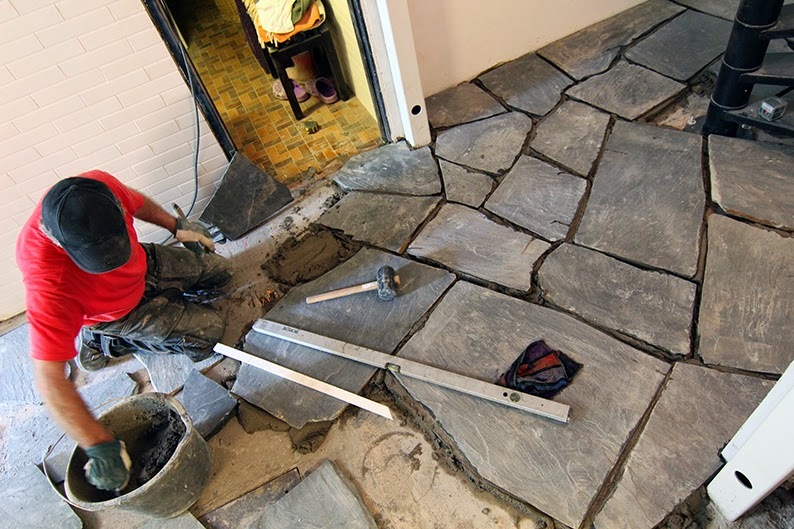 There are basically two ways you can make sure that the stones are all levelled. You can either use a good old bubble level. The more modern approach is to rely on a laser. In this process, Pekka had three responsibilities. 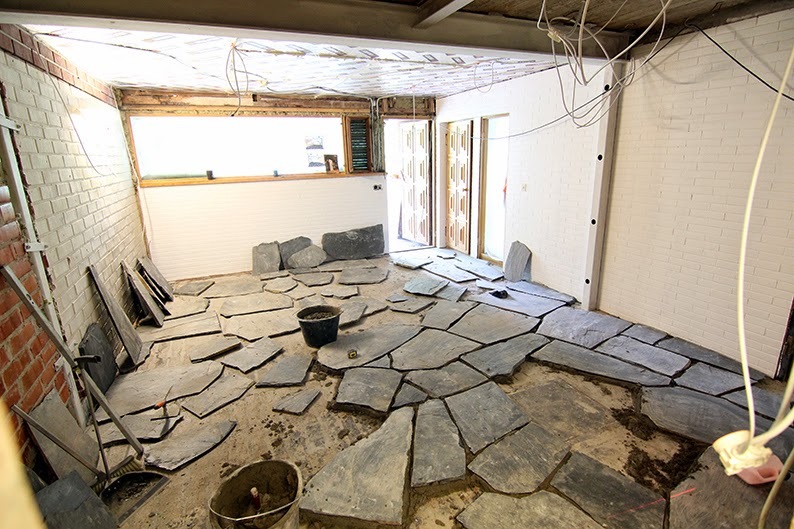 The first was to make sure there is always a good selection of stones available for the installation, in other words carrying the slate inside from the backyard. The second was to mix cement and naturally - carry it inside. During the first day, 30 sacks of cement each weighing 25 kg were consumed. So you are starting to get the picture of Pekka's preference on how to spend his vacation days! 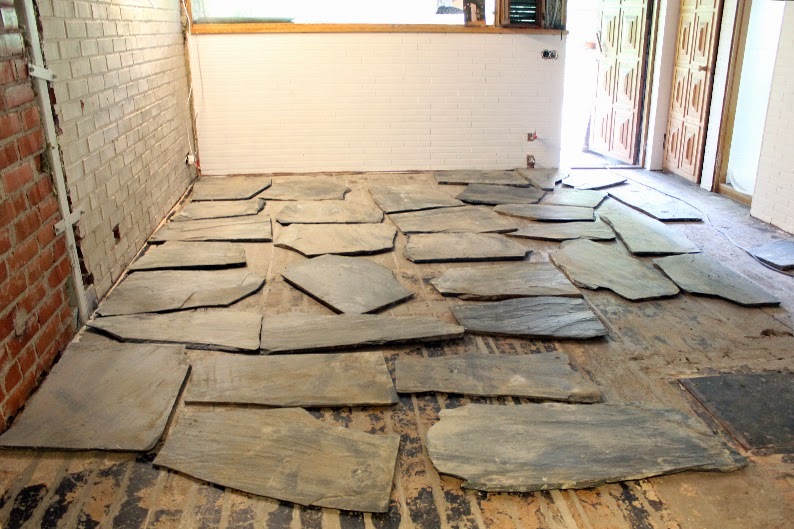 The last job will be to seam the slate. We have had some debates weather we should go with a lighter or darker tone (vs. stone colour) for the seam. At the moment it seems we are settling for the "lighter-than-the-slate-itself" option. During the first day, the guys managed to install almost half of the stones, which accounts for approximately 15 square meters. Not bad, not bad at all - to be continued on Monday. Moikka Ninni! Kiitos. Vaikka mekin kyllä tehdään paljon itse niin liuskekivilattian kanssa päädyimme pyytämään asentajan apua. Nyt kun asennusta on seurannut vierestä pari päivää niin ei se nyt ihan mitään hirveän vaikeaa puuhaa ole. Toki pitää tietää mitä tekee, mutta kun perustekniikka on selvä niin ei muuta kuin rohkeasti eteenpäin. Itseasiassa nyt opitun perusteella ajattelin itse asentaa alakerran pikkuhuoneen liuskekivet kesälomalla (http://theolivegreenwindow.blogspot.fi/2013/01/the-man-cave.html). Katsotaan miten äijän käy! Roomalaiset kivet eivät kuullosta nekään yhtään hullummalta! Kiva kuulla, ettei asennus kuitenkaan ole mitään rakettitiedettä. Jokainen laatta siis muotoillaan sopimaan ympäristöönsä rälläkällä? Ja sitten paksu asennuskerros betonia.